With HTC's upcoming crop of Androids, you'll be able to separate people into two distinct groups: those who spring for the brainier, better-specced Desire, and those who get bowled over by the beautiful, yet lesser-specced Legend. The Desire (or Nexus One) is the final word in the Androidsphere—it's a mark of someone who knows what they're doing, who wants to show people they NEED that extra computing power. If you compare it to the Legend, you could be justified in saying Legend-salivators are more shallow, ignoring the might of a Snapdragon processor in lieu of a unibody aluminum shell and slim build. The internal upgrades are minor, when you consider it next to the HTC Hero, but like the Empire Strikes Back, sometimes sequels are far better than the original. While we found the Hero "tragically flawed" in its slugginess, the Legend's slightly more powerful 600MHz processor behaved—well, like a legend. The 3.2-inch screen has the same amount of pixels as the Hero, but swaps the HVGA for a more superior AMOLED. The 5.0-megapixel camera is still the same quality, but has the much-welcomed addition of a flash. You get the picture—the Legend is building on the Hero's quality in incremental upgrades, but every change, however minor, radicalizes the experience of using the Legend. It's running Android 2.1, which as any Hero owner knows should be released as an over-the-air update soon. One day. The jump from 1.6 to 2.1 is impressive—it's a lot faster, the multitouch is better, there's greater integration of social networking profiles with contacts, and HTML5 support, amongst other—admittedly small—changes. Plain and simple—the Legend is the most well-built phone I've ever had in my hand. You just know when you feel the weight of it, the cool curved exterior of the unibody aluminum shell, and touch the ultra-responsive touchscreen. It's that sensation when you first tenderly held the original iPhone, which has been long-missing in the market. The bottom and top of the back is actually made from rubberized plastic though, so there are no issues with wireless signals—unlike the first generation of the iPhone. Removing part of the case reveals a very thin battery and a touch-sensitive catch which keeps the SIM and microSD cards encased. It's a small point, but it's also the most polished example of a phone's innards that I've ever seen. Just like BlackBerry, HTC is migrating its trackballs to optical trackpads. This is a relief, but in actual fact I barely had to use the trackpad—only when having to make an edit when typing out messages or emails. The screen is just so responsive, with nary a wrongly-actioned command made, that you can imagine HTC forgoing the trackpad altogether at a later date. Only eight buttons reside on the Legend's body. The on/off button up top, the two volume controls on the top left, and then on the lower face, home, menu, back and search. They all worked well, though the home, menu, back and search keys did feel a bit cheap in comparison to the high-end feeling of the rest of the handset. HTC's used the same 5.0-megapixel camera as we saw on the Hero, but the addition of a flash is a new and exciting step for them—strange as that sounds. As you can see from the two photos below, the flash is very strong—too strong, I'd say. However, the quality is decent in lowlight conditions—noisy for sure, but I've seen worse. In daytime I had a lot more luck. Testing it out on some cakes in my kitchen in the late afternoon sun retained the nice rays of sun across the cakes, with the yellow of the flowers showing up bright. But even at 5MP, the general image performance isn't enough to ditch your point and shoot just yet. Most manufacturers are skinning Android with their own proprietary interfaces...MOTOBLUR, Mediascape, S-Class, they're ok, but I'd almost rather use Android in its natural flavor than have to put up with some of their issues. 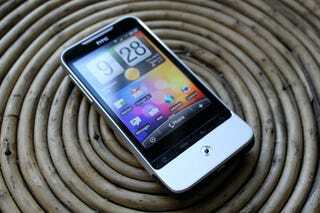 There just ain't no Android phone like a HTC Sense Android phone. It's simply the best skin an Android could ask for, even without the minor improvements seen in the Legend. By far the pick of the bunch is the new "Leap" view—or "Helicopter view" as it was known in-house when designed. It works much like Mac OS X's Exposé function, bringing all seven homescreens up as thumbnails. The feature is very useful, particularly if you just can't remember which screen your mail, or the weather widget, is listed on. The pinch command takes some getting used to, but once you've got the gesture down-pat, it's a godsend. But with ever feature that will be used often comes one with no point at all. FriendStream is a nice enough widget, which collates all your friends' updates from Twitter, Facebook and Flickr into one feed, but for anyone who's a purist and likes to see every form of update on each social networking site, it will be removed quickly from the homescreen. I preferred using HTC's own brilliant Twitter widget, Peep, for the full Twitter options, and the Facebook app to see every form of action. The Flickr integration is handy, being able to see when my contacts upload photos, but not necessary if you get email notifications already. Plus, FriendStream just felt slow sometimes—in fact, on a very speedy phone, it felt incongruous in comparison to everything else, often updating with tweets quite a few minutes later than the Twitter widget did. It's not a big problem, but for someone who relies on Twitter heavily as a source of entertainment, it became a source of frustration. The Legend ran 36 hours before it died on me. Not too bad, considering I had an hour-long call plus about five shorter ones, sent and received around 20 text messages, and spent almost a whole day browsing the web, checking Twitter, and showing it off to my friends. After the horror of seeing my G1's battery deplete in half a day when I first bought it, the Legend's 1300mAh battery ran to my satisfaction. True, other phones may be better specced, but with that premium build it's like comparing a Sony Vaio (not a bad laptop, sure) to a MacBook. Sometimes there's just no contest. While the extra horsepower and added touches of the Nexus One and Desire are nice, I found the Legend more than satisfactory. It wasn't sluggish, certainly didn't have bugs or issues like the G1 and Hero, and while it'll inevitably slow down and have you cursing the fact you didn't spring for something with a Snapdragon chip, I'm going to award it possibly the highest accolade a reviewer can gift a device: I'm going to upgrade to one. It's not the best Android phone. That badge still belongs to the Nexus One, or possibly the Desire, when we review it. But it's one of the best all-rounders, when you consider the hardware—and the feeling you're left with once it leaves your hand. I feel bereft without it. The HTC Legend hasn't been announced for the US market yet, with the European launch sometime this month.